Aquarius najas is a large water skater found on rivers, larger streams and lakes. It appears to require flowing water, or at least water movement as occurs at the edge of lakes. The bug overwinters as an adult and mates in May, the male riding on the back of the larger female for several days or even weeks, feeding on her prey, copulating several times and submerging with the female when she lays eggs beneath the water surface (Andersen 1982). Development from egg to adult takes approximately seven to eight weeks and there is one generation per year. 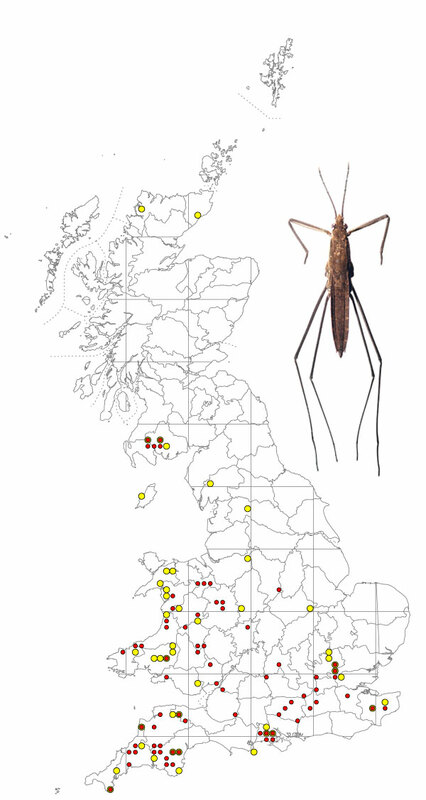 Aquarius najas (13 – 17 mm) is one of the larger water skaters found in Britain , the others being Aquarius paludum (14 – 16 mm) and Limnoporus rufoscutellus (established in Ireland only). All are distinguished by abdominal spines projecting from the tip of the abdomen. 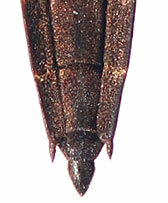 A. najas and L. rufoscutellus have shorter spines that do not reach the end of the abdomen (see below) but L. rufoscutellus can be distinguished by colour, the centre of the pronotum being rufous. A. paludum has spines that reach the tip of the abdomen.